Our outdoor Poly-Cotton, Polyester and Mega-TuffTM flags are finished with a strong, durable snow-white header. 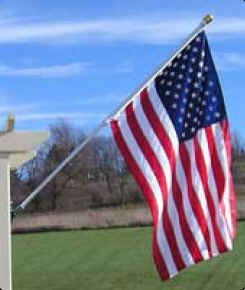 Unsurpassed in beauty and craftsmanship, our American Made U.S. Flags are manufactured to precise specifications. These fully printed lightweight polyester flags are the most popular choice for home sets and promotional use. They fly in the slightest breeze and offer superb color retention. The fly ends are double-stitched for added reinforcement and finished with white header and brass grommets. This fully printed poly-cotton flag has the look and feel of a cotton flag with the advantages of a polyester flag. Double-stitched fly ends and strong canvas header with brass grommets. These fully printed flags are manufactured with a synthetic fiber specially woven to allow the wind to flow through with greater ease. Double-stitched fly ends canvas header with brass grommets.